It's been about a month since I made these and I have been super excited to share them. 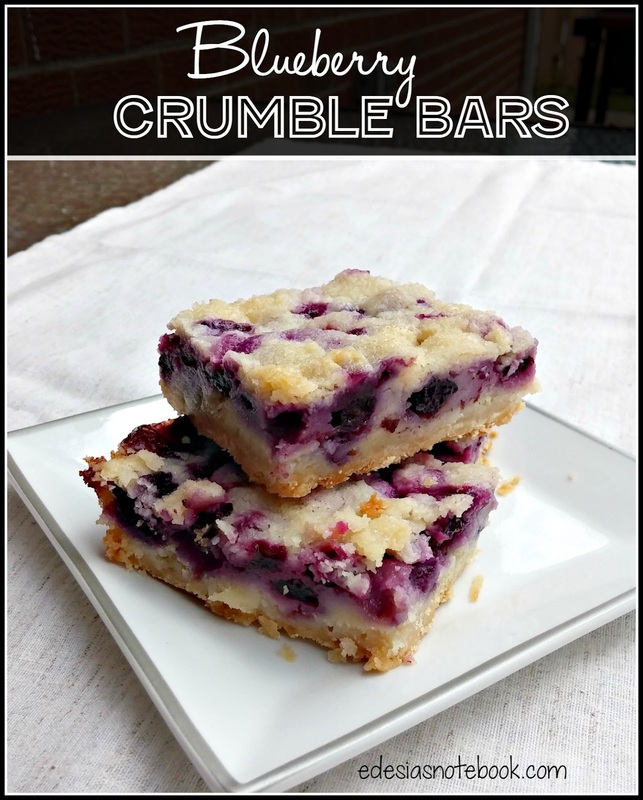 I don't even like blueberries (not at all), but I loved these bars! They have a yummy shortbread crust that doubles as a crumbly topping. Then in the middle is a sour cream custard filling and tons of fresh ripe blueberries. So so good. And being in bar form makes it so easy to cut up and serve. I got the recipe from Hot Eats and Cool Reads. Preheat oven to 350°. Coat an 11x7” baking dish with baking spray. In a medium bowl, combine the 1½ cups flour, ¾ cup sugar, and pinch of salt. Cut in cold butter using a pastry blender until butter is evenly distributed. Remove 1 cup of this mixture and set it aside. Press the rest into the bottom of the prepared baking dish and bake for 15 minutes. Remove from oven and let cool. In another bowl, combine the eggs, remaining ⅓ cup flour, remaining 1 cup sugar, and sour cream. Fold in blueberries. Pour this mixture over the cooled crust. Sprinkle the remaining crust mixture over the top. Bake for an additional 50-55 minutes, or until top is lightly browned. Remove from oven and let cool completely before cutting into bars and serving. Refrigerate any leftovers. This is a real crowd-pleaser. It would be perfect for any of those summertime gatherings you are invited to: backyard cookouts, church picnics, etc. And because it's packed with fresh fruit, I think you could get by serving this in slightly breakfast-y situations like brunch or anytime you would serve coffeecake. It's a really great recipe to have in your collection.